Charger Holder. This charger holder is designed for replacing the holder that is used for 8gm chargers. 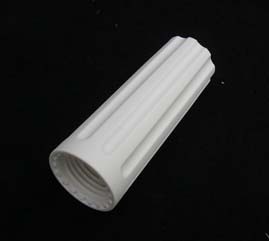 This holder fits the 8gm charges that we sell on www.creamchargers.org.uk it will fit ¼, ½ and litre sizes of plastic head whipped cream dispensers. It is also suitable to be used with Mosa soda syphons and will accommodate their CO2 refills. NB: this replacement part will NOT the larger 16gm sized equipment and neither is it suitable for Liss brand soda syphons. Metal head dispenser are extremely durable and we have never had need to stock these parts so these plastic charger holders are the only ones that we stock at Cheeky Monkey Cream Chargers. What is a charger holder? The clue is very much in the title – this is the piece of kit that holds the nitrous oxide cylinder (charger) as you screw it down onto its threaded counterpart on the dispenser the charger is pierced which allows the gas to flow into the dispenser. In most cases, the holder does not need to be a complete seal because the mouth of the charger cylinder is sealed as it makes a union with the dispenser head. This item is suitbale for our cheaper (Royal Mail) delivery options or combine it with a larger order to take advantage of discounted delivery. This charger holder is designed for replacing the holder that is used for 8gm chargers. This holder fits the 8gm charges that we sell on www.creamchargers.org.uk it will fit ¼, ½ and litre sizes of plastic head whipped cream dispensers. It is also suitable to be used with Mosa soda syphons and will accommodate their CO2 refills. NB: this replacement part will NOT the larger 16gm sized equipment and neither is it suitable for Liss brand soda syphons. Metal head dispenser are extremely durable and we have never had need to stock these parts so these plastic charger holders are the only ones that we stock at Cheeky Monkey Cream Chargers. What is a charger holder? The clue is very much in the title – this is the piece of kit that holds the nitrous oxide cylinder (charger) as you screw it down onto its threaded counterpart on the dispenser the charger is pierced which allows the gas to flow into the dispenser. In most cases, the holder does not need to be a complete seal because the mouth of the charger cylinder is sealed as it makes a union with the dispenser head. This item is suitbale for our cheaper (Royal Mail) delivery options or combine it with a larger order to take advantage of discounted delivery.